If we see that our contemporary condition is one of war and widely diffused complexity, how do we understand our most basic ethical motivations? What might be the aims of our political activity? A War on People takes up these questions and offers a glimpse of a possible alternative future in this ethnographically and theoretically rich examination of the activity of some unlikely political actors: users of heroin and crack cocaine, both active and former. 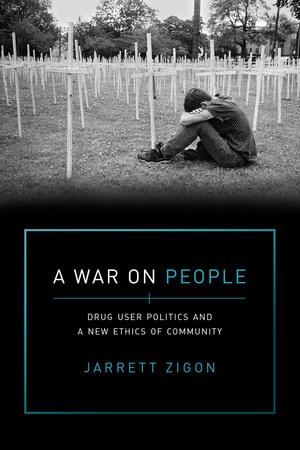 The result is a groundbreaking book on how anti–drug war political activity offers transformative processes that are termed worldbuilding and enacts nonnormative, open, and relationally inclusive alternatives to such key concepts as community, freedom, and care. Read the author's article about the opiod crisis on Open Democracy. Jarrett Zigon is the William and Linda Porterfield Professor of Bioethics and Professor of Anthropology at the University of Virginia. His two most recent books are Disappointment: Toward a Critical Hermeneutics of Worldbuilding and "HIV is God’s Blessing": Rehabilitating Morality in Neoliberal Russia.